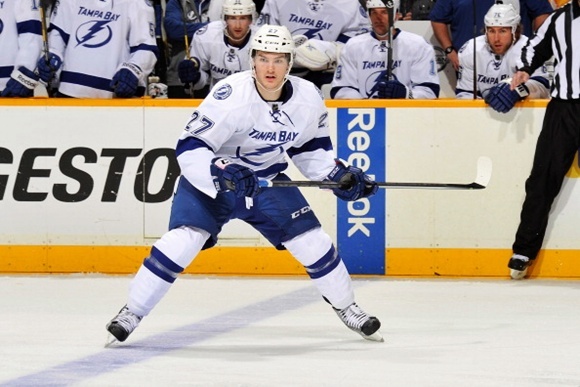 Tampa Bay certainly did not wait long in the 2014-2015 regular season to call up top prospect Jonathan Drouin. Just a couple of weeks into the regular season, the 19-year old is set to make an impact at the NHL level right away. While the hype is real surrounding the forward, just how good can he be from a fantasy hockey perspective in year one? During the preseason, some thought that Drouin would be ready to play on opening night of the regular season. However, a fractured right thumb held him out of some important training opportunities, so Tampa Bay sent him to Syracuse to begin the season. At the beginning of his NHL career, Tampa Bay expects to play him regularly. After all, it would be silly for them to call up a promising youngster and place him on the bench instead of allowing him to get reps. He will most likely be on the third line at first, and his playmaking at center or left wing should allow him to contribute in fantasy hockey right away. He is worth taking a risk on, especially if a person is in a keeper league. Tampa Bay is off to a decent start so far this season, as they stand at 3-1-1 on the year. They feel like they have a chance to be pretty competitive in the Eastern Conference if they are able to stay healthy. Drouin is going to have a chance to make this team a serious threat for the Stanley Cup if he is as good as advertised. The Lightning will not be putting huge expectations on him just yet, but they do think he has a chance to be a franchise type of guy down the road once he gets familiar with this level of play.